When you're shopping online for a mens full length charcoal wool overcoat and you're looking for something in a fashion color that goes great even with brown color suits, this charcoal gray full length wool overcoat can make that a reality. 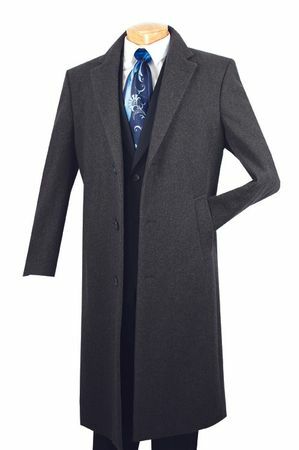 Made by Vinci, this mens full length charcoal wool overcoat features a wool and cashmere fabric with a soft touch and features a single breasted style that you'll love wearing for years. These overcoats are sized to fit over your suits so please order your exact size for a proper fit.